Chesterton, Indiana, May 12, 2010 – Third generation Beverly Shores and Chicago resident Ari Killian has an eye for development. The rehabilitation of one of Porter County’s oldest residences, the E.L. Furness Mansion on Route 20, into Duneswalk Inn at the Furness Mansion, a vacation rental property opening in July, is the latest project for Mr. Killian’s Consortian Construction. This construction engineer has had building on the brain since he was a child. Ask his family, and they will tell you how he was fascinated by Frederick and Robert Bartlett’s plan for Beverly Shores since he could ride his bicycle around and up and down the lakefront community’s winding roads. Ask his fiancé, and she will tell you that the bicycle was replaced by his truck, and Mr. Killian’s exploration now encompasses Lake, Porter, and LaPorte Counties. But, it was a mere three miles from his family home in Beverly Shores that Mr. Killian’s love for the dunes, history, and development converged. The Furness Mansion on Route 20 near Kemil Beach Road, caught his eye last summer and now, he never has to let go. Work started almost immediately after the closing, and the neighbors will tell you, this time, this project is different. The Furness Mansion has seen many attempts at development as a bed and breakfast, a restaurant, and condominiums, but those projects were missing a key ingredient – a drive and passion for the Indiana Dunes like Mr. Killian’s. 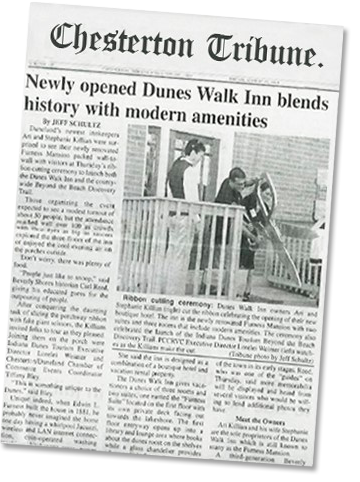 Now, he wants everyone to visit and stay awhile at the new Duneswalk Inn. For Mr. Killian’s company, Consortian Construction, an experienced builder in the Chicago Metro area, this is the first major project in the Dunes. Both a commercial and residential developer, Consortian has won recognition from the Chicago Commission on Landmarks. Consortian’s expansion into Indiana is a natural fit given Mr. Killian’s almost 60-year family history in the Dunes. Mr. Killian is on-site most days; if you stop by and catch him, the proprietor of Duneswalk Inn at the Furness Mansion will be happy to show you around.